Be Part of the Human Chain in Berlin to Save the Whole World! Sometimes Berlin is such a tolerant and peaceful place to live that we tend to forget how fucked up certain things really are. I mean, of course, there are many terrible and dangerous things going on (climate change, terrorism, HIV and so on). But certain things are beyond bad. They are so bad that we can’t even believe that they actually exist and are a real threat to us. I am speaking about nuclear weapons, which became more like an abstract concept in the last 25 years of the end of the cold war (at least on European soil). But nuclear weapons are absurdly real and in times of Trump and Kim Jong-Un they get even closer to our privileged peaceful lives. This Saturday there is an incredible opportunity to fight them here in Berlin. 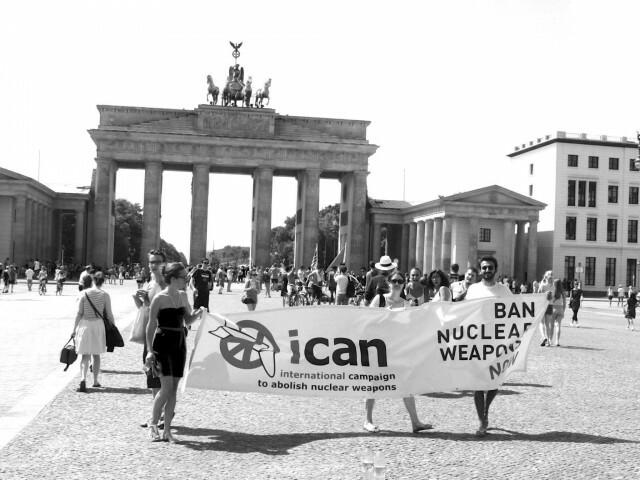 ICAN – the International Campaign to Abolish Nuclear Weapons who won the Nobel Peace Prize this year are organizing a Human Chain between the Embassy of North Korea and the US-Embassy. I had a little chat with the Board Member of ICAN Germany, Leo Hoffmann-Axthelm, born and raised in Berlin, about the protest and why we should all show up there. thank you for your time and congratulations to the Nobel Peace Prize. Tell us more about Ican and what’s your personal involvement. Hi Claudio, good to see you again. I got involved in nuclear disarmament diplomacy in 2010, and we couldn’t help but notice it was absolutely dysfunctional. Even the simplest concessions made decades ago were not being implemented, even though those commitments had been agreed by consensus. Straightforward measures to reduce the dangers of nuclear weapons – in the end, machines designed to kill as many innocent civilians as possible. So something had to change. And we met the ICAN folks at those conferences, and they asked us to set up a German office, so we did. In fact the first office was our flat-share, with the other “Mitbewohner” also being a co-founder. Since then, we’ve gained a lot more staff and supporters. Today, I represent the ICAN campaign in Brussels, mainly with the EU institutions. Growing up in Berlin after the Fall of the Wall you experienced the city in a time of economic growth and political stability. What made you still question this stability? Any personal experience that is linked to your involvement with Ican? Excellent question. While Berlin was certainly politically stable, you cannot grow up in this city without being confronted daily with the big power shifts that occurred with the end of the Cold War, with the Berlin Wall as the most tangible symbol of that. While the up-and-coming Berlin scene has always harboured and propelled alternative thinking, it seems pretty obvious to me that the end of the Cold War did not make nukes disappear. But we sort of forgot about them, and that’s a huge danger. These weapons of mass destruction are aging, the soldiers moving them around are demotivated. And this apathy has allowed the German Government to continue basing its security on the threat of use of weapons of mass destruction, via nuclear deterrence. We even have German pilots training to drop US nuclear weapons hosted on German territory. And this in a country where, representative surveys consistently show, well over 90% of people reject nuclear weapons out-of-hand. So it’s clear that to increase the pressure on the government, people need to be aware of the presence of nuclear weapons, and of the large role they play in German foreign policy. 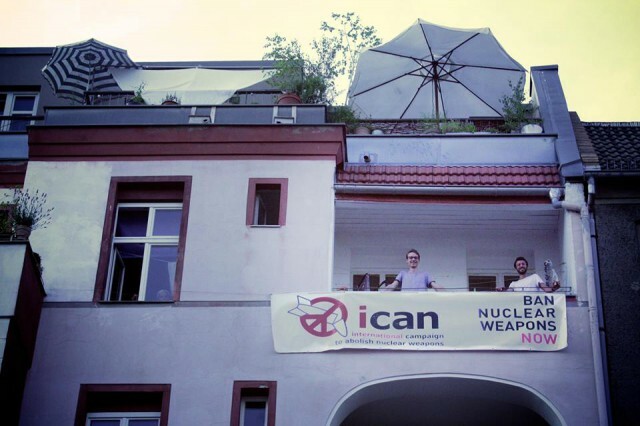 The WG of Leo in Berlin was the first Headquarter of ICAN Germany. You will create a Human Chain between the two embassies of North Korea and the US. Do you expect a reaction from these two institutions? What would be a success for this particular demonstration? Indeed! The main idea is to draw attention to a very specific instrument we now have to push against the escalation of the nuclear threats between the USA and the DPRK. While people were busy covering the G20 in Hamburg, 122 nations came together at the UN in New York to adopt the first treaty completely prohibiting nuclear weapons. That’s a historic step, and it deserves a lot more attention than the fact that a handful of countries still believe they need weapons of mass destruction to keep themselves safe. So the people in the Human Chain symbolize the world coming together, to connect the belligerent few. 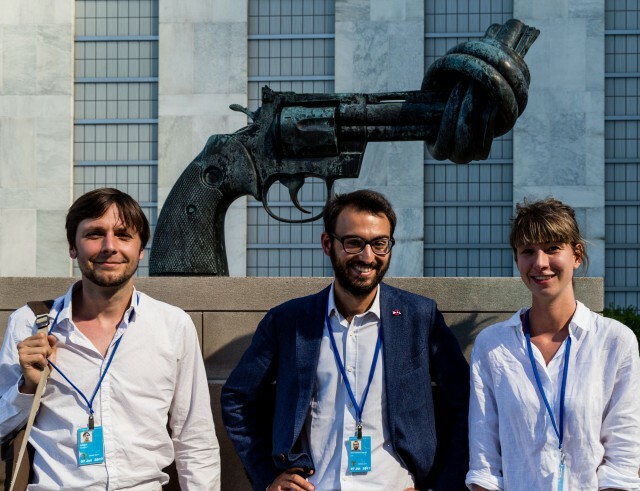 It also makes sense for ICAN to organize this, as ICAN was also the driving force behind the treaty, working with governments to make the ban happen – work which was honored with the Nobel Peace Prize this year. Do we expect a reaction from the US and North Korea? Well, it would be good if their leaders woke up to the fact that while they’re busy threatening to literally incinerate millions of innocent civilians, the rest of the world is absolutely horrified by their lack of humanity, and has, in fact, outlawed their horrific bombs this July. Sure, outlawing murder didn’t make the phenomenon disappear. but before you get rid of the weapons, you gotta agree that killing people by the millions, or threatening to do so, is generally speaking something we cannot accept. The ban treaty codifies as much under international law, changing perceptions legally, politically, morally, and even financially. Why is Berlin an important spot for your protest? Berlin is crucial because of the role Germany plays within NATO. All of NATO has boycotted the negotiations and the Treaty on the Prohibition of Nuclear Weapons (TPNW). 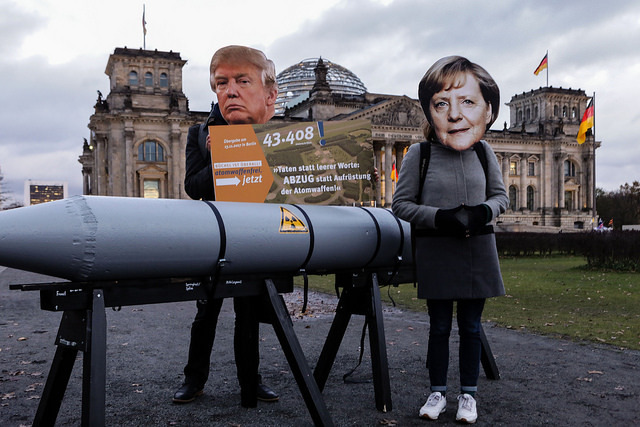 Especially for Germany, this was a watershed moment: this was the first time the German government was forced to admit that they are, in fact, opposed to the prohibition of nuclear weapons. Before, they had always been able to claim supporting nuclear disarmament, while whining about the lack of concrete progress. Now, they have actually stood in the way of that progress. So we will need to get NATO governments on board. That’s not really a problem: NATO is really a flexible organisation, its founding treaty is silent on the issue of nuclear weapons. So someone will need to be the first mover. I work a lot with the Italian government, and they are definitely willing to challenge this reluctance. And soon, NATO will have to introduce an opt-out from nuclear deterrence, with the German government stating clearly that under no circumstances should weapons of mass destruction be used on the behalf of the German people. This is indeed good news! Can you name three good reasons everybody should join your protest on Saturday? Absolutely! One: we are in the midst of coalition talks, so this is one of the few, precious opportunities when Government policy on nuclear weapons can actually change. Any political action has a lot more leverage now! 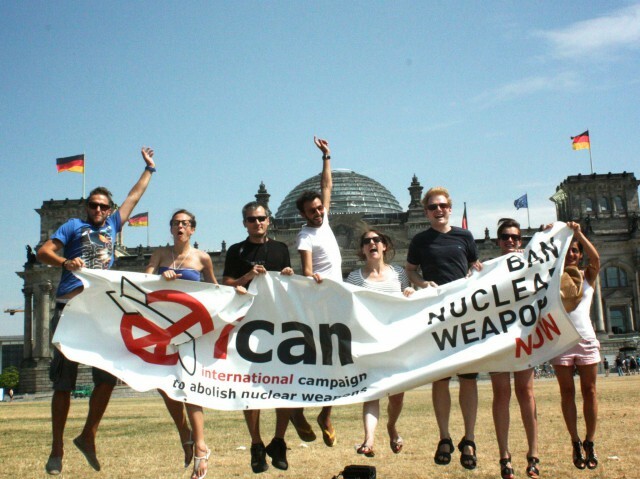 Two: We just noted the German government is actively opposing and undermining the prohibition of nuclear weapons. This in a country where more than 90% oppose such weapons. Doesn’t that make you outraged? Isn’t it simply beyond belief that the government has for years been showing such blatant disregard for the priorities of the citizens it serves, betting on widespread apathy? And last but not least: it will be loads of fun! I’ll be enacting Kim Jong-un. There’ll be music, techno under Brandenburg Gate etc. – how could there not be? Lots of people making nuclear disarmament great again. So we hope to meet a lot of new faces there, including from among your readers, and put the pressure where it belongs – on the Jamaika coalition talks. Ok! Great. I am looking forward to see you as Kim Jong-Un at the Human Chain! Sounds terrific! One Kilometre – One Thousand people.